In 2011, I walked the Coast to Coast walk in England with a friend and we had a great trip, although the last three days were very poor weather-wise, considering we were walking in July. We had torrential rain, drifting fog and at times, strong winds. 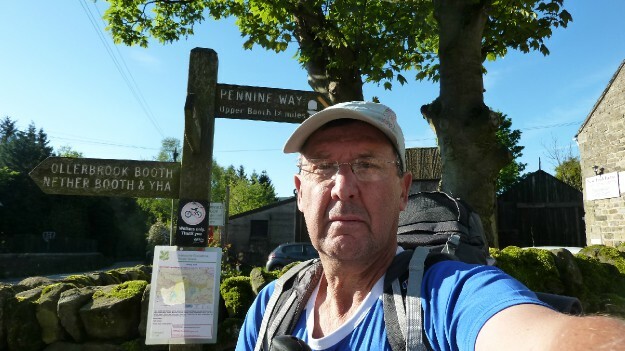 Since that hike, I felt that I needed to begin planning another long distance hike and after a lot of thought, I decided on the Pennine Way. This hike has been on my 'bucket list' for many years and as I approach my sixtieth year, I thought it was time to cross another name off of my list while I'm still fit enough. I contacted the friend I had walked the Coast to Coast with to see if he was interested in accompanying me on the walk and was pleased when he agreed. However, after a number of e-mails where I sensed that he was cooling towards the idea, he eventually pulled out of the walk saying that he didn't feel fit enough to complete what is a fairly strenuous slog up the spine of England. Although I was initially disappointed that I would not have him along for company, I eventually realised that this was an opportunity to take on the walk as a solo challenge, making it even more of an adventure. So, on May 10th 2014 I flew to the UK and my hometown of Luton before travelling north to start the walk on Wednesday 14th May. Having decided to undertake the walk alone, I found that I was excited and slightly apprehensive at the same time. Suddenly, the walk had taken on a new life, my friends withdrawal having thrown it into sharper focus. I had walked England's Coast to Coast alone many years earlier in 1998 but this felt different. This is partly because when I walked the CTC alone, I pre-booked accommodation before setting off so I had a fixed destination each day but also, the PW simply felt more of a challenge. This was not just because of its greater length and the fact that I planned to camp as much as possible, but also because it sounded more lonely and remote than the CTC. This wasn't just something in my imagination either, the CTC is easily in the top two of the UK's most walked trails and it's common for people to meet up each evening in a pub at each overnight stop along the way as a sort of 'travelling community' is formed. Having read various accounts of the PW it was clear that this sort of thing is far less common. The trip from my hometown of Luton to Edale was fairly uneventful. I caught the National Express bus from Luton Railway station to Sheffield, with a fifty minute wait in Milton Keynes while I waited for the Sheffield bus. The railway station in Sheffield is just across the road from the bus station and I had a wait of over an hour for the train to Edale. This part of the trip was much more interesting, albeit shorter. I spent most of the journey trying to identify hills in the Peak District, without much success I have to say, until the train reached the Hope Valley, where I could clearly identify the Great Ridge and Mam Tor. 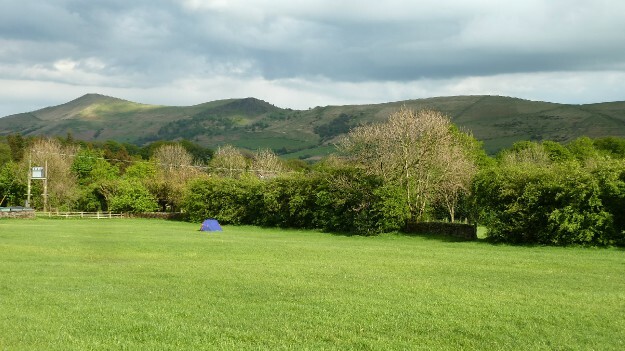 This very enjoyable part of the trip was over all too quickly and I alighted from the train and walked into Edale village where I checked into Cooper's campsite, which is right at the start of the Way and also conveniently sited across the road from the Old Nag's Head pub. Not long after pitching the tent, a fairly heavy shower blew in and I retreated into the tent while it passed over. It was during the shower that I discovered something that came to affect the whole trip and cause me to change my plans for the walk. As the rain fell on the tent, I happened to glance out of the inner tent into the outer and discovered that rain was penetrating the flysheet and wetting the inner. I had also noticed when pitching the tent that the groundsheet of the inner, which is black, was criss-crossed with white crease marks, something that I hadn't remembered seeing the last time I had used it on the Coast to Coast walk in 2011. Since that walk, I had not used the tent and it had spent the intervening time in it's stuff sack in the garage, where it had spent most of it's 14 years of life since I had purchased it. The tent, a Vango TBS micro, was fairly expensive at the time of purchase and had always been totally reliable so I was a little perturbed at this development. This feeling was further exacerbated by the discovery that the tape on the seams of the flysheet appeared to be peeling off. I had decided I would have to camp around two out of every three nights as the cost of using guesthouses was prohibitive and my budget wouldn't stretch to using them for close on three weeks. Eventually, the shower passed over and I retired to the Old Nag's Head where I had a few pints of real ale and a meal while I wrestled with the pubs wi-fi as I tried to contact my wife on my tablet. Later, I returned to the tent where I had quite a good nights sleep, although the problems with the tent were still nagging away in the back of my mind.